This morning, I drove my son to school and pulled up in the school road. And we were in a tearing hurry. But everything stopped for quite a minute, as Felix strapped Bumpy The Elephant into his passenger seat. It was a solemn business. It took a good while, because Bumpy is a tiny fraction of Felix’s height, and a seat belt didn’t come naturally. But he succeeded. And for the rest of the day- an unbelievably trying one – I would look at the passenger seat and nod to Bumpy, my partner in crime. But Kate, I hear you say, he’s just an amalgam of stuffing and velour, a once glorious child’s toy which has been loved into shabbiness. And I would answer: Mate, this morning at 9am, in a very posh suit indeed, I was roasted in a very important meeting. And as a consequence, no-one is prizing that small blue elephant from my car. He’s Bumpy, and he’s in my team. I mention this because I am not the only grown up who occasionally sets store by the strange menagerie of cloth creatures who inhabit the houses of man. I was wandering the huts of Bletchley Hall on Saturday. Bletchley: the place where the government’s Code and Cypher School was run during the war. Here, some of the finest minds of the time tackled challenges which ultimately helped win the war. Here, the codes generated by the German Enigma Machine were decrypted. And in this bastion of grown up-ness, what should I come upon but a great big teddy bear. Porgy sits in a glass case, and I can’t help thinking he must be a little lonesome in there. He is there because one day, long ago, that genius and inventor of the first computer, picked him up in a toy shop. And he was not a youngster when he bought Porgy. He was all grown up. He used to practice his lectures in front of Porgy, it is said, while at Cambridge. And one Christmas, say the signs at Bletchley Park, he delighted a niece – Shuna Turing – with a gesture of pure childlike elation. “My mother, “she recalls, “Alan’s sister-in-law, made me a little skirt with braces and red buttons and as a surprise, I woke up the next morning to find Porgy wearing matching trousers, braces and buttons. Just occasionally, a cuddly toy can acquire significance, even when we are grown up. As Bumpy and Porgy so ably demonstrate. 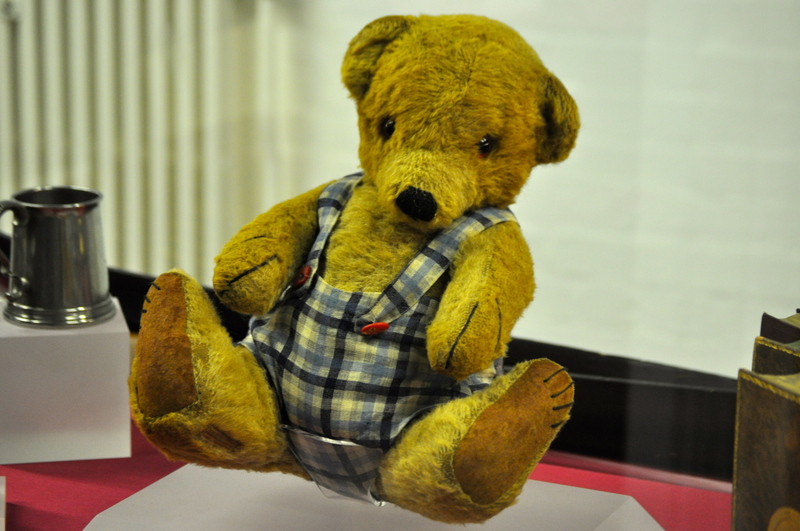 Posted in Quirks of HistoryTagged Alan Turing, bletchley park, Teddy bear, toysBookmark the permalink. Never too old for a cuddly teddy bear…I have several and I love them all ! There is something about them, isn’t there, Karmami! Thanks for coming along, reading and commenting today. The adventures of Bumpy and Turing. Wouldn’t that make a fitting book title? Or, How Turing Helped Win the War. It is late here on the Cutoff. My mind gets all stuffy this time of day, especially when thinking about stuffed bears. Fun, Kate. Going to prep at 7 years old, in the 50’s, weaned me off cuddly toys quite quickly. Adults were more understanding of the importance of teddy bears than were my peers. Yes: peers can be unforgiving, especially at public school. Shame: I know several high powered executives with major companies who have a small battered teddy bear at home. Very hard to resist hugging a teddy bear. It is, Lou. Strange how they are derived from a real animal who is solitary and can be ferocious. Wouldn’t hug a real bear. Lovely post – my mom has a pooh bear that is indispensable, and I’m not above having a few of my childhood teddy bears (and an elephant, too) perched on shelves to watch over me! Hi Katie – good to hear about that elephant. We’re a fan of stuffed elephants here.Long may he and his colleagues watch over you. Not your imagination. I wonder if he signed the Official Secrets Act? We just did a clean out of these and I found that I was the one talking the boys into “hanging on” to them. 😀 They’d regret throwing them out later, Tammy…. The harder the mind works the more it needs toys. Sometimes the simplest things mean the most to us when the world beats us down. Bumpy sounds great. And so does Porgy. Of course this is coming from an old guy who plays with trains and has Doctor Who toys lined up behind his desk. And yes, I have a bear. Winnie the Pooh. Have had him forever and he is still my hero. You are in great company, Michael. I spent the first eight years of our marriage helping Phil kit out a tiny ‘n’ gauge railway for our small house in Kent. We love trains. And Dr Who is just a way of life. Phil walked in and informed me this morning that this is the 40th anniversary of the death of Roger Delgado, the man who played the first Master in Dr Who. Sigh. I had not realized that. Will have to lift a glass in his honor this evening. The Master is one of my favorite characters. Surely Babbage is the inventor of the first computer? I still have two bears, a zebra, and have just added Mother’s sheep and giraffe to the soft toy menagerie. Local pride at stake: he was a Walworth lad! Bumpy the Elephant! I love that name. Porgy must have heard quite a few interesting lectures in his day. And he looks very dashing in his braces and trousers and fancy red buttons. You and Phil are both softies when it comes to stuffed animals, eh? Hope your day today is a bit less trying. BTW: How’s your 4-3 diet plan working? Have your switched it for a 1-1-1-1-1-1-1 plan with alternating days of diet and digging in? Hope you’ve recovered from your nasty meeting. All the best people have a bear – or in my case a panda! A stuffed animal is a wonderful way to hold onto a bit of the child in each of us…my grandmother occasionally bought a bear or bunny, saying they were for the children, but I don’t think that was the whole story. 🙂 I love the image I’ve created of Felix and Bumpy. It’s a very sweet friendship! I love the way children take them so seriously… when my daughter-in -law moved house, I had to take my eight year old grand-daughter’s numerous dollies, and put them in the back seat of the car to drive them to the new house. She wouldn’t hear of them being packed up – they had to have fresh air – so there they all were in the back of my ca, breathing fresh air! I have several stuffed bears and other animals. They are a great comfort and provide a chuckle when I need it most. As you’ve seen, we have many plush friends who help us through our days around here. Cheers to Bumpy and Porgy! Hello, I was wondering if you have a reference for the story about Alan Turing’s bear. I’m writing a paper and have seen this story a lot but no one references where it came from. I have also seen a conflicting story in a few places that states that Alan’s mother bought him the bear… Thanks you any help you can give. Hi Melissa, apologies – I write this a very long time ago! 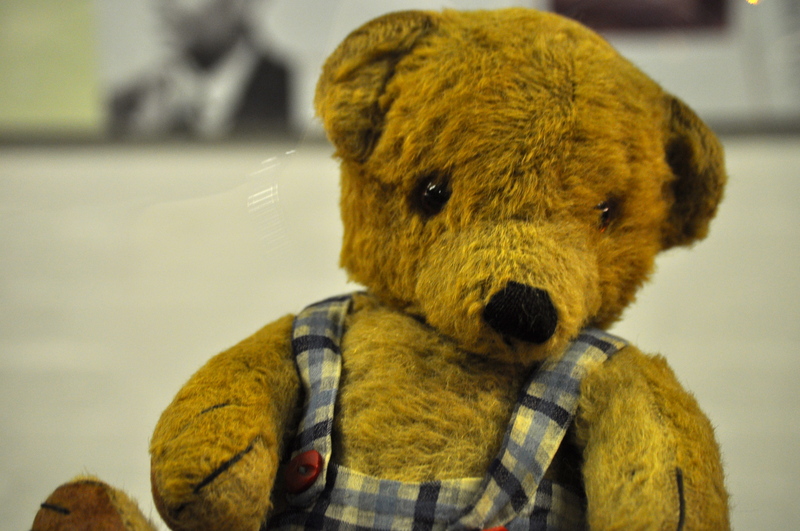 My information comes from interpretation at Bletchley Park, where the bear is held. A quick communication with them should clarify things. Keep me posted!